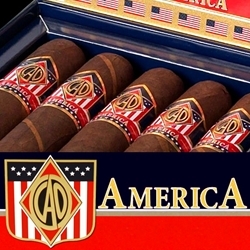 Release in 2007, CAO America hand-rolled premium cigars crafted with a unique sleek barber-pole style wrapper consisting of a dark Connecticut Broadleaf Maduro and lighter Connecticut Shade. Inside each CAO America cigar you will find a delicate blend of premium long filler Ligero tobaccos from Nicaragua, Italy, U.S.A., and the Dominican Republic bound in a zesty Brazilian leaf. The mixture of these tobaccos result in a truly complex, full bodied cigar that produces a smoke that is robust, creamy, complex and marvelously smooth with a clean finish. Smokers Discounts believes you'll really enjoy CAO America premium cigars. We’ve made it easy and affordable to buy these hand-rolled cigars online and have them delivered right to your front doorstep. Try the one of the varieties of sizes and flavors listed below at our online cigar store. Each of these styles are in stock today at a low discount price! Call us for more details!